Though the season’s first harvest of asparagus yielded but a handful, it was enough to finally welcome spring to our table with a glorious green pasta primavera. We make some version of this as the selection of spring vegetables ebbs and flows. 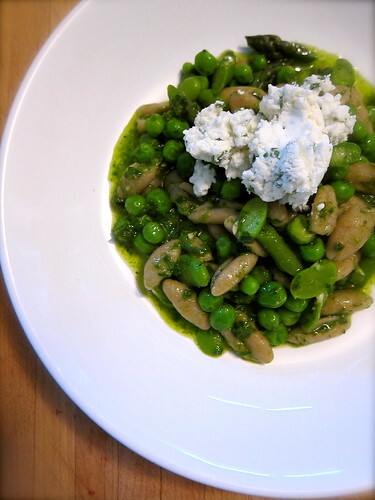 At the moment, peas and favas are weeks away, and are from freezer stores, a harbinger of what’s to come. Once they’re here, we’ll bask in their sweetness, adding them to the increasing number of spears of asparagus. Later, we’ll add snap peas and slivers of tender green beans, or thin coins of radishes for color and crunch. If you find them in time, a handful of fiddleheads wouldn’t be out of place. For this occasion, we made a batch of tiny cavatelli, imagining how the curl of this shell-shaped pasta would catch the brothy sauce. A loose pesto, bright emerald green from a combination of leafy greens, brings it all together, and a finishing dollop of soft cheese, such as ricotta or a mild goat cheese, adds a silky note. For the pesto, we gathered some fresh chard and spring onions — chives, walking onions, and garlic chives — from the garden, added a few leaves of sorrel for tartness, and processed it all with enough olive oil to form a loose pesto or salsa verde. Once it comes in, we’ll reach for some mint, also ramps when available. The vegetables are cooked with the pasta, thrown in towards the end, then everything is drained and dressed with the pesto. If the consistency of the dish seems stiff, add some reserved pasta cooking water, just enough to relax things. Pick a small-sized pasta, something spoonable like this cavetelli, or ditalini, or also orzo. Alternatively, this is as delicious stirred in some risotto, a pot of simmered beans (dried or green), a bowl of couscous or new potatoes. Local ingredients: Homemade pasta, with whole grain durum flour from Fiddler’s Green Farm; homemade goat cheese, with goat milk from Jesta Farm; asparagus, peas, favas, chard, spring onions, and sorrel from the garden. 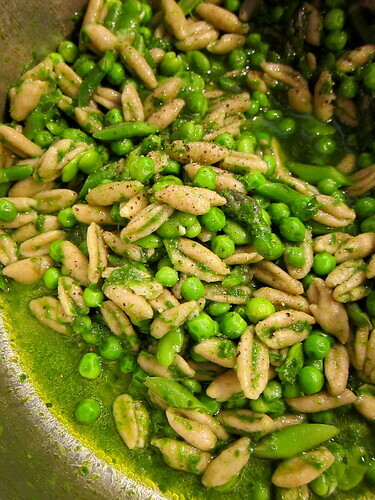 This entry was posted in cooking and tagged alliums, asparagus, beans, favas, herbs, pasta, peas. Bookmark the permalink. Looks great. We ate some fresh asparagus this week also. Like peas, the best part of growing asparagus is getting to eat it freshly picked! Oh! So lovely! I can imagine that amazing sauce: sorrel is one of my favorites in the Spring, and the mint overnote sounds just wonderful. Love the soft cheese idea! It’s just what the season is offering, having a limited range of choice forces one to be creative! Ahhhh…. asparagus, my favorite vegetable. We are buying it fresh at Farmers’ Markets and Applecrest Farm. All versions of this recipe look divine. Ours also! As with rhubarb, it takes several years for it to establish but once it does, it’s lovely to be able to count on every year. Wonderful that it’s now more available through local farmers! Lovely pasta with the bright green from the vegetables! It’s what we crave this time of the season!